Kid Row is the antithesis of the boring piano lesson where you are taught “Frère Jacques” but you wanna learn Nirvana. 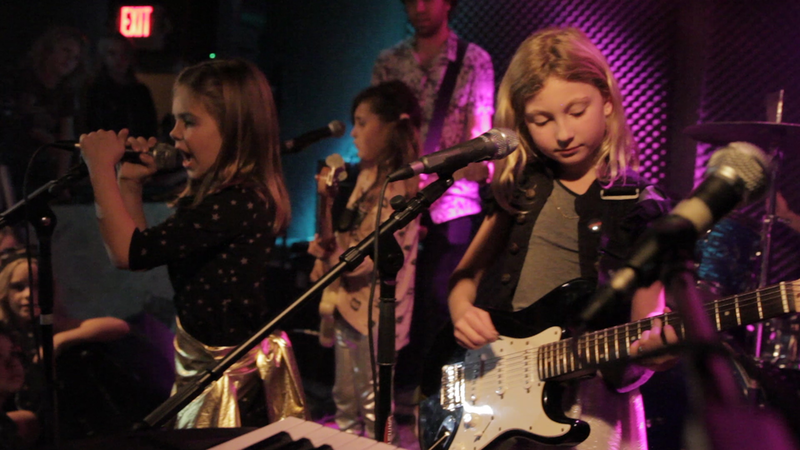 Kid Row students are put into bands in the showcase rooms at Bedrock Rehearsal Studios in Silver Lake, and taught the songs that they love, coupled with rock ‘n’ roll classics. This is designed to give both a positive and relatable first experience playing music with friends as well an exposure to the musical history that influenced their current favorites. Lead and founded by professional musicians husband and wife duo, Jana and Justin Bocchieri, each season culminates with a full-on rock show, NOT a recital. Parents and peers alike crowd the stage, singing along and always effortlessly selling the venue out of white wine and chicken nuggets, literally! Culmination show at Hi Hat Aug 3 at 2pm! Band rehearsals and private lessons are held once per week at Bedrock Rehearsal Studios in Silverlake. All programs culminate with a full-on rock Show! 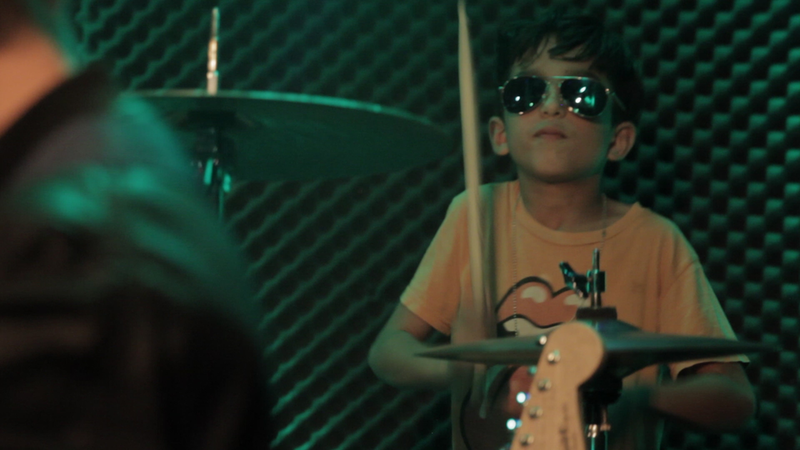 Discounted 30 minute Private Lessons for any student enrolled in a Kid Row band. Private lessons are highly encouraged, as they help ensure that students come to rehearsals prepared and confident! Students will learn how to DJ on both digital and vinyl formats as well as learn about musical history through the songs! Each day will have a different musical genre theme from Hip Hop to Funk to Rock. Professional DJ’s will visit class and discuss their careers. Culminates with each student developing their own mix to perform at an end-of-week dance party for kids and parents and are additionally invited to DJ the Kid Row end-of-season show Aug 3rd! Students will write and perform an original song in a band setting, learn about different songwriting techniques and how to record! Professional songwriters and producers will visit class throughout the week to discuss their careers. Culminates with a recording session in a professional studio, designing album artwork, and release on Spotify as well as a field trip to a record pressing plant to watch their song get pressed to vinyl and leave with a copy! Jana Bocchieri is the Founder of Kid Row. She is a music instructor, singer / songwriter, professional vocalist, multi-instrumentalist, and Berklee College of Music graduate from Los Angeles, CA. Her backing vocal work includes features on Dance Moms (Lifetime) and notable live performances including arena shows with hit-songwriter Bonnie McKee for KISS FM's Jingle Ball tour as well as composition for Minds of MountainFilm featuring Supersize Me director Morgan Spurlock. Jana brings a youthful spirit and passion for fun education to Kid Row! Justin Bocchieri is a Berklee College of Music graduate, lead singer / songwriter of the alternative rock band Paper Pilots and Co-Executive Director of Sound Art, a nonprofit which places music programs into the most underserved neighborhoods of Los Angeles. His band Paper Pilots have garnered features including World Cafe: Next Artist, licenses on HBO and recent support dates with OKGO. Being a multi-instrumentalist, songwriter, performer and educator, Justin brings a well-rounded instructing aesthetic to Kid Row with over a decade’s experience teaching music. Jesse McInturff is a Los Angeles based Guitarist, Composer & Music Educator. Growing up on the Minnesota-Iowa border in a small town, Jesse discovered the guitar at 17 and fell in love instantly. From there he started his first punk band who rehearsed in a barn and never looked back. Eventually Jesse joined Minneapolis based electro-metal band Screaming Mechanical Brain with whom he toured the country from 2007 to 2013. With the breakup of his band he finally moved to Los Angeles and has been perusing music education and music for TV & film ever since. Although Jesses touring background is in heavy rock acts his love of the guitar goes for all styles, and Jesse is always a fan of teaching student’s what they’re interested in, not what he is interested in. Originally hailing from the Lone Star State, Perry Morris is a Los Angeles-based session percussionist and music instructor. Perry grew up playing with African dance troupes and Salsa bands before graduating from Berklee College of Music with an emphasis on jazz, blues, and country. These experiences, coupled with his years as an instructor, gives Perry an unbridled enthusiasm for teaching. With his down-home Texas sayings and his worldly musical curiosity, his love for music and the learning of it is fun and infectious! Liv Slingerland is an alternative rock signer-songwriter and multi-instrumentalist currently based in Los Angeles, CA. Liv studied guitar performance in USC’s Popular Music Program, earning her B.M. in 2015 alongside furthering her studies of bass, vocals, piano, theory, ear training, and songwriting. Liv has self-released her band’s debut EP, Come Back to Me, and has been playing live with her band at local venues such as the Hi Hat, The Echo, and The Satellite. While working on her own project, Liv also plays and records with other groups and artists, most notably as bassist/ background vocalist for rock artist Lauren Ruth Ward and guitarist/background vocalist for indie folk-pop band Lucy & La Mer.